Salami may be just a type of sausage, but it is actually a very versatile product. It can be a pizza topping, paired with wine and cheese, mixed with other ingredients to make a sandwich filling, or eaten as a simple appetizer. If you are a salami fan, or have bought salami before, you are probably aware that there is not just one type of salami. 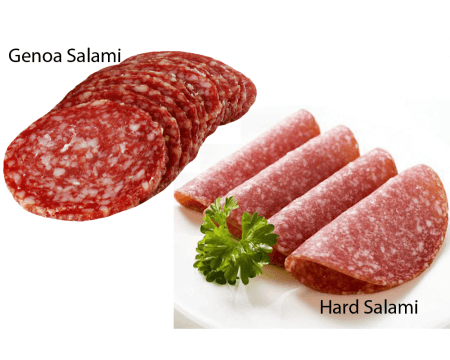 There are many types of salami, but the two most common are Genoa salami and hard salami. Are they the same? Well, both are delicious and they almost look the same, but they are different. The difference between the two will be discussed in this article. Genoa salami is named after a place in Italy – Genoa – where it originated. In Genoa, it was easier to raise pigs than cattle because of the lack of plains, so most Genoese foods feature pork as the main ingredient. Because Genoa salami mainly contains pork (although small amounts of beef may be also be added), it contains a high level of fat and is very greasy. Before it goes through curing, herbs, peppercorns, wine, garlic and salt are added to it for flavor. It has a relatively soft and fermented taste because of the wine added to it in the process. On the other hand, hard salami is believed to have originated in Central Europe. It is made mainly from beef but may also contain pork, so it is a little bit darker than most types of sausages. Other ingredients like herbs, spices and salt are added. As well as being cured and dried, hard salami also undergoes a smoking process. Hard salami, as the name suggests, is noticeably harder or firmer than other sausages. It also has a coarse and dry texture. What, then, is the difference between Genoa and hard salami? Although both sausages may contain a combination of beef and pork, Genoa is mainly made from pork while hard salami is mainly made from beef. Other ingredients like spices, herbs, peppercorns, and wine are added to Genoa salami but hard salami is not seasoned with peppercorns. Additionally, Genoa has a higher fat content than hard salami. Both types of salami go through a curing process. However, only hard salami undergoes smoking. When it comes to color, texture and taste, hard salami is darker and firmer than Genoa. Because it contains wine, Genoa salami has a fermented taste and a greasy and softer texture while hard salami has a dry and coarse texture. In terms of origin, Genoa originated in Genoa, Italy while hard salami originated in Central Europe.